The 7th National beef cattle show took place in the “Greinbachhalle” in Styria. 13 different breeds, alltogether 250 cattles from 8 federal states were shown. Simmental was represented by 27 cattle. Our heifer Boszena Pp (Sire: Poldau PP) was plced second in her group and I achieved the third place at the young breeders championship with her. Other Styrian participants were family Kerschbaumer with an United- heifer (first place in her group and best muscled heifer in her group), family Steinberger with a Gorm cow and her calf sired by Heraldik (third place and best muscled cow in her group). Johann Lienhart showed a young bull, sired by United. 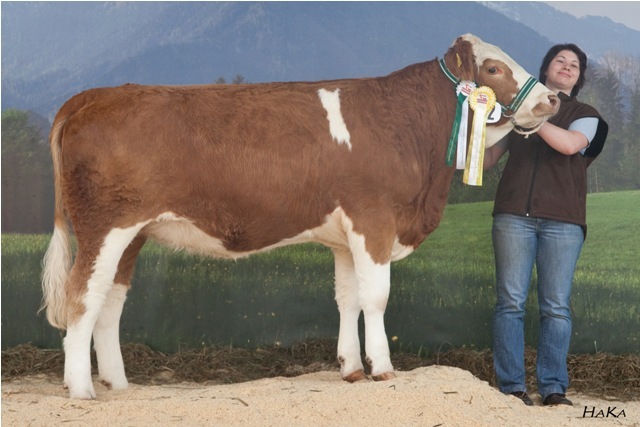 The title Simmental female champion was awarded to Kroatia P (sire: Poker PP), owned by the agriculural professional school Althofen, Carinthia. Simmental male champion is Rambo, owned by Genostar, bred by Martin Bittermann, Lower Austria.